JIT Delivery Dedication - Mohawk's 2018 Delivery Average - Mohawk Electrical Systems, Inc.
Meeting customers delivery goals is a crucial and important part of Mohawk’s business. Working with “Precision Life Critical Assemblies”, Mohawk’s goal is to meet and exceed customers expectations. 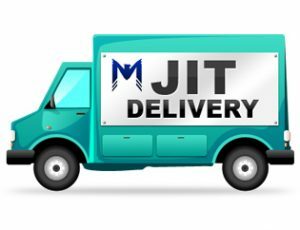 Read more on how Mohawk accomplishes JIT Delivery, click here. 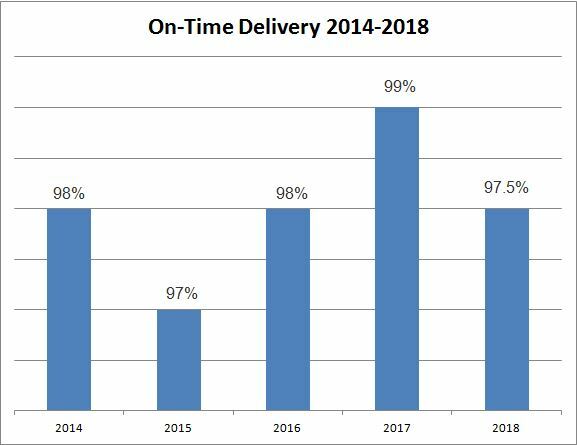 Over the past 5 years, Mohawk’s just-in-time (JIT) delivery averaged 98% between 2014 and 2018. 2018 took a dip from the year before, with 2017’s average being 99%. Keeping the average above 95% is the goal every year. At occasions, plant operations may need improvement which may cause a dip in delivery averages. Through effective corrective actions and open lines of communication, Mohawk and late deliveries are kept to low levels. Every summer, Mohawk sends out an annual customer survey to address any issues with current or past year orders. None of Mohawk’s critiques are about delivery or communication, both scoring high on an average scale of 1-10. To see more of Mohawk’s customer testimonials, click here. Want to work with a manufacturing company who puts value on on-time delivery? To contact Mohawk, click here.